This outer box is designed to hold Lever Arch and Box files, without the need for additional inner boxes, and is stackable (up to 7 in height is recommended) so you can make a wall of your archived files and yet access them easily as the front of the box opens downwards towards you. 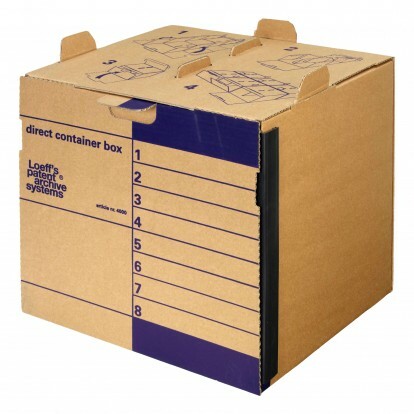 Suitable for horizontal storage of 4 box files with a back width of 80mm or 6 document files with a back width of 60mm. Overall dimensions are 410(w)x275(h)x370(d)mm. It is geared to the sizes of the Quick Box A4 AB3000 and Foolscap box files AB3003. These outer containers are made of FSC certified pH-neutral corrugated cardboard.Glue and ink do not contain any hazardous substances. We highly recomended that if you stack these against a wall that you use the stablishers (AB4110), if you are stacking them back to back they are not required. Click here for a Youtube video showing how easy these are to set up and use.